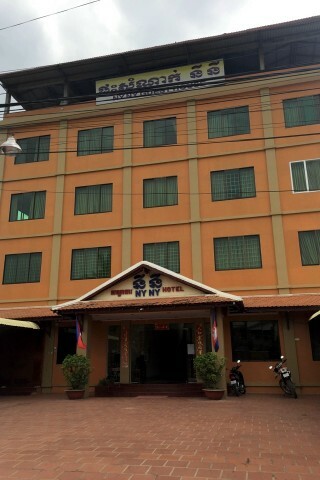 Located in downtown Kampot, just above the Salt Mine Workers roundabout, the bright orange Ny Ny is a great choice if the room is more important than a cool vibe or hangout space. Average rating 7.7 from 97 reviews. This is a classic example of a Khmer guesthouse at its best - 27 spotless rooms with air-con or fan arranged over three floors. Rooms come with comfortable mattresses, TV, WiFi and hot water shower, with fresh drinking water and clean towels provided daily. Rooms are double or twin, with a discount for single occupancy. Staff are friendly and can book tickets and tours. Although there’s no bar or restaurant on site, Blissful, Magic Sponge and Heng Leap cafe are all a few steps from the door. Check rates at Ny Ny Guesthouse on Booking.com.